When the Kansas Regional Homeland Security Councils were formed in late 2005, many of the regions began planning and fundi ng interoperable communications projects; but soon it became evident that the regions were not necessarily coordinating their efforts. In response, communications project leaders from each region began meeting quarterly to share information on communications projects in hope of aligning efforts and avoiding unnecessary duplication of services. From this informal group, a statewide initiative was created. In July of 2007 a full-time Interoperable Communications Coordinator was employed by the Kansas Adjutant General. The Coordinator was tasked with the creation and implementation of a statewide governance structure and a strategic plan addressing interoperable emergency communications. Later that year, the Kansas Statewide Interoperability Executive Committee (SIEC) was chartered by the Kansas Commission on Emergency Planning and Response. The SIEC met in its first formal meeting in November, 2007. During that meeting, it was decided by the members of the SIEC to pursue executive-level backing for its activities. From that decision, Governor Kathleen Sebelius signed Executive Order #07-27, which re-established the SIEC under executive jurisdiction. 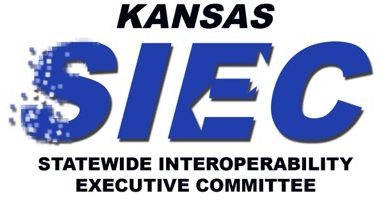 The SIEC membership, comprised of 14 public officials as well as representatives of primary stakeholders, are the key decision makers on planning, policy, and procedures that will enhance communications interoperability throughout Kansas. Looking at communications interoperability from a statewide approach, the SIEC considers issues such as planning, training, standard operating procedures, technology-based standards, and grant fund management. This collaborative group of individuals is committed to maintaining a multi-jurisdictional and multi-disciplinary partnership between all levels of government as we work together to enhance our ability to communicate. Kansas State Fire Chiefs Assoc. (Vice Chair) - Chief Bob McLemore, Colby Fire Dept.